Vicente Valtieri is a Breton assassin and a member of the Dark Brotherhood. He is your first contract giver in the Guild. He was stricken with vampirism while he was in an expedition to Morrowind, and after he deems you worthy he will offer to pass you the "dark gift". Before you have spoken with him to get your first assignment, he will spend the full day waiting patiently for you in his Private Quarters, without ever eating or sleeping, but once he has introduced himself he will resume his normal schedule. Every day he sleeps in his Quarters from 6am to 10am. Once he has woken up, he will find a suitable spot where he can sit and read one of the two books that he is carrying. After a reading period of six hours, he will leave his Quarters to stroll around the rest of the Sanctuary for the rest of the day, until his bedtime. His attire consists of a few rare pieces of clothing: a dark shirt and a pair of black wide pants, both of which are zero weight items, along with a pair of leather boots and a gold necklace. He is armed with a leveled longsword, which can be enchanted, but he also carries an unenchanted longsword and an extra enchanted claymore, both leveled. He also possesses a copy of Guide to Cheydinhal, a copy of The Five Tenets, the key that unlocks the abandoned house, and a leveled amount of gold. As a vampire, Vicente possesses all relevant abilities. Upon first approaching him after having spoken with Ocheeva, he will kindly welcome you, "Ah, here you are. So good to finally meet you." Upon talking, he will warmly greet you while explaining some of his duties in the Sanctuary: "Warmest greetings to you. I trust you've already spoken with Ocheeva? I am Vicente Valtieri. I provide assignments for all new family members. Please do not let my appearance...unnerve you. The needs and Tenets of the Dark Brotherhood come before my own needs as a vampire." When you leave conversation with him, his dialogue depends on his disposition. If it's above 70, he'll say, "Spill some blood for me, dear Brother/Sister." If it's between 30 and 70, he'll say, "Farewell, Brother/Sister." If it's below 30, he'll say, "Blech! I would not feed on you if you were the last warm body in Tamriel!" This pattern also applies when you approach him. If he likes you, he'll say, "You are like a dark gift from the Night Mother herself. Please, tell me how I can help." If his opinion on you is mediocre, he'll say "Hello, my Brother/Sister." If he hates you, he'll say, "Were I not ordered to assist you I would forego the Tenets and feast on your blood!" Being a vampire, he has been a member of the Sanctuary longer than the other members, and will tell you some background history if you ask him about the current Speaker watching over the Sanctuary: "When I first joined the family, this Sanctuary was controlled by another Speaker. Lucien took over when she was killed while fulfilling a contract." On the Night Mother, he tells you what she does: "The Night Mother speaks to only one member of the Dark Brotherhood --- the Listener of the Black Hand. And when Our Lady speaks, death follows." He'll also tell you about Sithis: "Sithis is the darkness of time immemorial. He is no Daedra, and dwells not in the realm of Oblivion. No, Sithis is something altogether... different." Ask him about the Sanctuary, and he'll give more background history: "This Sanctuary has been here since before even I joined the Dark Brotherhood, and that was two-hundred years ago." Vicente also seems to know the Count of Skingrad's dark secret, as he will tell you if you inquire about some rumors: "The Count of Skingrad is not all he seems. Let's just say I'm not the only one who enjoys his evenings..." Also, if you inquire about how he became a vampire he will tell you his story and even hint about your future: "I was stricken with vampirism three-hundred years ago, while on an expedition deep into the Ashlands of Vvardenfell. For nearly a hundred years I hunted in secret, until the Dark Brotherhood found me. Now I have a family that accepts and even values my unique gifts. Perhaps in the future, when I feel you have earned the right, I will offer you a chance to become a hunter of the night." "The Elves of the Imperial City are a fairly close-knit community. One of them will have at least heard of Faelian. You should ask around." "I look at you and wonder how you're still alive, considering your utter incompetence as an assassin. With any luck, this contract will be your last." "These mercenary groups tend to be fanatically loyal to whomever leader they follow. Roderick's people will likely fight to the death. Be cautious." "Roderick is a mercenary leader, and his people are fanatically loyal. They will cut you to ribbons if they see you. And they will see you." "The key to successfully completing this contract is effectively blending in with the other guests. So for Sithis' sake, do not wear your hood..."
"So, it's to be five against one, is it? The odds are against you. With any luck, you'll be dead within an hour." "Phillida may be retired, but he'll likely have a bodyguard, probably a member of the Leyawiin City Watch. You may have to dispose of him as well." "What madness has stricken the Black Hand, that they would trust such an important task to someone so very useless?" And after receiving the "special contract" from Lucien Lachance, he will advise you to complete it, unaware that he is one of the targets: "Lachance would not have selected you for a contract unless he had the utmost confidence in your abilities. Best not let him down." When attacked during the special contract, he will exclaim, "Why, Brother?" When accepting your first contract he will provide you with information about what a contract is: "A contract is a pact one enters into with the Dark Brotherhood. They provide us with the gold, and we remove someone from existence. A contract is fulfilled by a skilled assassin such as yourself, who keeps the Dark Brotherhood's end of the bargain. So it has always been. While carrying out a contract, you may have the opportunity to earn a bonus if certain parameters are met." If you inquire more about the bonus topic he will tell you that: "Some contracts are straightforward. Find the target, eliminate them, then return to the Sanctuary. No time limits or complications. However, many of our clients request that their contracts be carried out in a specific manner. A certain place, a certain method of elimination. We try to honor this requests whenever possible. After all, the Dark Brotherhood's reputation has been built on providing... good service. Any Brother or Sister who can complete a contract while fulfilling a specific request will receive a valuable bonus, oftentimes a powerful magic item." If you deny the contract, he will say: "Pity. I'm eager to see how you fare on your first assignment. Well, the contract will still be here when you're ready." Once you accept the contract for the quest, he will explain the situation to you: "Excellent. Here is what you must do. Go to the Waterfront District of the Imperial City. There you will find a ship named the Marie Elena. Board the ship and find its captain, Gaston Tussaud. He'll be in his cabin. Eliminate Tussaud in any manner you see fit. The pirates have been moving a lot of cargo onboard lately. You may be able to smuggle yourself on board in one of the packing crates. Oh, and one more thing. Get into the habit of asking your fellow family members about any current contract. Their insight may prove invaluable." Valtieri will also provide some info about Tussaud if you ask about the contract, "As a pirate, Gaston Tussaud has certainly spilled his share of blood. Someone wants revenge, and they've hired us to extract it." If you talk to him before Tussaud is killed, he will remind you: "Let's not waste time on pleasantries. Gaston Tussaud is still alive, and it's your job to remedy that. I suggest you tend to your duties." Once you have fulfilled the contract, he will congratulate you by saying: "So, the pirate has been eliminated. Excellent. No one will mourn his passing, and Sithis has been appeased." "We need you to stage an... accident. Kill the target in the manner specified, and you'll receive a considerable bonus." If you decline, he will be say: "Well then, I suggest you get your affairs in order and return to me as soon as you're able." Once you accept the contract, he'll say: "As I expected. Good. The target is a Wood Elf named Baenlin. You will find him at his home in Bruma. Enter secretly and avoid his manservant, Gromm. On the second floor is a secreted door leading to a crawlspace. Inside are the fastenings of a mounted head that hangs over Baenlin's favorite chair. Loosen the fastenings any night between 8:00 pm and 11:00 pm, and the head will surely fall on Baenlin as he relaxes in his chair, as is his custom. If Baenlin is eliminated in any other manner, or if the manservant Gromm is killed, you will forfeit the bonus. Now go, and may Sithis be with you." If you ask him about the contract again, he will repeat himself: "You are to travel to Bruma, enter the house of the Wood Elf Baenlin, and kill him. It should look like an accident. I'm sure you can handle it." If you try to talk to him again before Baenlin is killed, he will urge you on: "Every moment that Baenlin draws breath is an affront to Sithis and the Night Mother. Fulfill the contract and honor the Brotherhood as you should." If you didn't kill Baenlin in the way you should have, he will be disappointed and tell you: "Baenlin is dead, yes, but you did not fulfill the contract precisely as directed. I will grant your reward of gold, but the bonus is forfeit. Despite this misfortune, you are ready for advancement. I appoint you Slayer for the Dark Brotherhood. Now go, and continue to serve Sithis well." However, if you did kill him in the proper way, he will say: "So, the accident has been staged, and Baenlin lies dead. Well done! You have more than earned your reward and bonus. I present to you this dagger. It's an enchanted blade, known as Sufferthorn. Its prick is deadly, I assure you. Yes, you are quite an asset to this Sanctuary. In fact, I believe you are ready for advancement. I hereby appoint you Slayer. Well done! Now go, child of Sithis. Go and rest. You'll need it." "Back for more? It just so happens I have another contract available, one that requires an expert in infiltration." If you decline his offer for the contract, he will be disappointed: "Hmm. I thought you'd jump at the opportunity to infiltrate the most heavily fortified prison in all of Cyrodiil. Maybe I overestimated you after all." When asked about the contract again, he will tell you the job: "Ever broken out of jail? How do you feel about breaking into one? The Imperial Prison, to be exact. We need a prisoner... silenced. Can you do it?" Once you have accepted the contract he will fill you in with the details of the target: "As always, you fail to disappoint me. Your target is a Dark Elf named Valen Dreth. He thinks he's safe in prison. He is tragically mistaken. 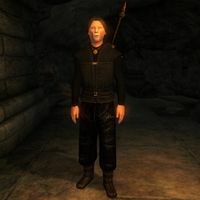 A prisoner recently escaped from the prison, using a set of secret tunnels connecting to the Imperial City's sewer system. It's a perfect way inside. Just outside of the Imperial Prison is a grating that leads to the sewers. It has recently been tightly locked, but I will provide a key. It should be easy enough to locate Dreth in his small cell. Besides, I think you know the way, hmmm. He he he he he. Valen Dreth has been imprisoned for many years. His tongue is sharp, but his body is limp and frail. He will prove an easy, pleasurable kill. You will receive a bonus if you fulfill the contract without killing any of the prison guards. Now go, and may the Night Mother go with you." If you ask him about the contract again, he will simply repeat: "You must infiltrate the Imperial Prison and kill Valen Dreth, a Dark Elf. He should be easy enough to eliminate, once you actually get inside." If you approach him again before Dreth is dead, he will urge you on: "Why does Valen Dreth still live? Breaking into the Imperial Prison is difficult, I know, but the contract must be fulfilled." If you return to him without having fulfilled the parameters specified he will say: "Valen Dreth lies dead, but why the unsanctioned bloodshed? You seem to lack... discipline. Here is your reward, but I'm afraid the bonus is forfeit." However, if you killed Dreth in the manner specified he will congratulate you by saying:"So, you infiltrated the Imperial Prison, eliminated Valen Dreth, and killed not one guard. Most excellent! In addition to your standard reward, I present to you this bonus. Behold, the Scales of Pitiless Justice! While carried, the scales will magically enhance your Strength, Intelligence and Agility... but diminish your Personality. A powerful tool indeed." "I have a special contract that needs fulfillment. In truth. I don't wish to offer it to any other family member. I've come to rely on your abilities. We're usually called upon to take a life, but not this time. This contract requires us to stage the assassination of a marked man." If you decline the contract, Vicente will be disappointedly remind you: "As you wish. Just remember, had I issued a direct order, you would not have been able to refuse. So say the Tenets. Consider what I have said." Once you accept the assignment he will explain you the details of the contract: "You must go to the city of Chorrol and break into the house of Francois Motierre. Inside you will find Motierre waiting for you. Do not kill him! You see, Francois Motierre is a marked man. He owes a considerable sum to the wrong kind of people. So, they have sent an enforcer to kill him. This is an unusual contract, Motierre had to make a special arrangement with us before it was approved. I trust in your professionalism." If you inquire about how they agreed to this unusual contract, he will explain you how it was approved: "The Dark Brotherhood is not in the business of staging deaths, no matter how much gold is offered. Sithis demands blood, and blood must be paid. In order to accept the contract, we demanded a life. Motierre offered his mother, and we accepted. Lucien has already taken care of that... detail." If you also ask him about the blade, he will either say: "The knife I gave you has been coated with a rare poison called Languorwine. You need only cut Motierre once, and he will appear to die." or "The blade has been coated with a rare poison called Languorwine. One drop in a normal human bloodstream will mimic the effects of death immediately. I have provided you with a vial of antidote, which will be used to revive Francois Motierre after you successfully stage his death. You should also know that there's only enough Languorwine on the blade for this one contract. After Motierre is sliced, the knife will be useless." If you return to him after having failed the quest he will have two different lines of dialogue. If you failed the quest by killing Motierre he will say: "So, Francois Motierre has been killed. He hired us, sacrificed his own mother's blood, and we could not even fulfill our end of the bargain" and if you killed Hides-His-Heart, he will say: "So, the enforcer Hides-His-Heart has been killed. He was to bear witness of Motierre's death, and report back to his superiors." Either way he will conclude with: "By failing to fulfill this contract, you have brought shame upon us all. Leave me now, and contemplate your uselessness as a member of this family." However, if you succeed the quest, he will pleased, "Ah, so Motierre has escaped? Well done! As payment, I am pleased to award you this amulet, Cruelty's Heart, as well as another advancement in rank. I hereby bestow upon you the title of Eliminator. Your blood is cold, your heart hard. You exemplify everything the Dark Brotherhood stands for. I present to you now this key. It unlocks the well behind the Abandoned House above. Use it to gain hidden, quick access to this Sanctuary." Vicente has a scripted "Weakness to Garlic". If he is carrying any garlic, he is inflicted with Damage Strength 100pts, Damage Endurance 100pts, Weakness to Normal Weapons 100%, and Weakness to Magic 100%. Since garlic is a zero weight item, it can be reverse pickpocketed onto Vicente if you wish to dramatically weaken him. In Vicente's desk in the Cheydinhal sanctuary, there is a note addressed to Ocheeva. The note amusingly berates Antoinetta Marie for her horrible cooking, and then goes into detail about Vicente's garlic "allergy". It also mentions that other vampires are not in fact affected by this weakness. This note is likely meant as a hint to let you know about Vicente's Weakness to Garlic. Vicente's AI package (DarkVicenteCatChat) target during his schedule from 4pm to 12am is set to M'raaj-Dar in a radius of 600 ft. Since M'raaj-Dar spends his day changing from location, Vicente will follow him, always trying to get as close to him as possible. Vicente mentions being inflicted with vampirism in Vvardenfell, which should make him an unofficial member of one of the three bloodlines there (Berne, Aundae, or Quarra). However, the type of vampirism he gives you is the same as all other vampires in Cyrodiil. This page was last modified on 22 January 2019, at 18:52.